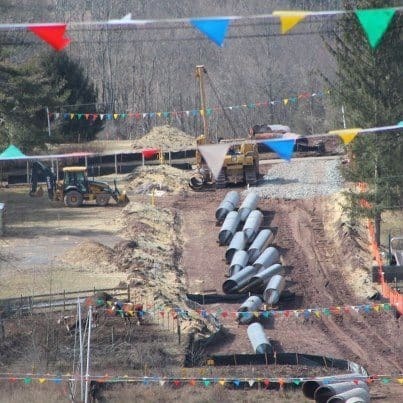 Photo of a Transco pipeline project from Fight the Pipe. The town of Princeton is releasing documents for the Transco pipeline project after previously telling residents some documents were not public. At a Princeton Council meeting last week, some residents complained that the town was taking a position that some maps and diagrams regarding the project were not accessible to the public. Town lawyer Ed Schmierer told residents that Transco representatives said the documents are not public because releasing them could jeopardize security. Residents pointed out that the maps have been on view at two public meetings. Under the state’s Open Public Records Act, a public document is any document maintained or kept on file by a government agency. There are several exceptions to the law such as victim records, computer security records, and building security records, but there is no exception under the law for the kind of maps created by the Williams Co. for the Transco project. Planet Princeton filed a public records request with the town the day after the Council meeting, requesting each document, map or diagram on file with the town regarding the gas pipeline project from June 1, 2012 to the present, and received a response Friday. The town has agreed to release the records. The records are available for inspection in the offices of the town’s engineering department during business hours, from 9 a.m. to 5 p.m., by appointment. Hard copies of the maps on filed with the engineering department are $27.85. Officials said the maps cannot be copied internally and must be sent out for copying. The charge represents Princeton’s actual costs for reproducing one full set of maps, officials said. Journalists are not in a special class when it comes to receiving public records in New Jersey. In other words, if the documents are available to the press, they are available to the rest of the public. Residents who were previously told the maps were not public documents should try again. The Williams Company’s proposed Transco Leidy Southeast Expansion Project, if approved by the federal government, would affect residents Princeton, Montgomery, Branchburg, and Readington. The project would affect more than 30 properties along the Great Road in Princeton along the environmentally sensitive Princeton Ridge. About 1.2 miles of pipeline would be built running parallel to the existing pipeline in Princeton and another five miles if pipeline would be expanded in Montgomery. If the Federal Energy Regulatory Commission approves the project, construction of the new portion of the gas line, called the Skillman Loop, could start in fall of 2014. The Transco pipeline spans 10,200 miles from South Texas to New York City. Another Transco project, the proposed Stanton Loop, would run along about 90 homes in Hunterdon County, including several dozens properties in Clinton and others in Union, Franklin and Readington. The town could make life easier for people interested in public documents by providing electronic records. For example, instead of asking for $27.85 for a copy of each individual map, how about getting a high resolution camera, taking a photo of the map, printing it to PDF and emailing it to us? That would cost $0 and take less time than arranging to send it out for copying. Princeton are usually pretty good about sharing records, but they are not in the electronic age. Documents that could easily be scanned and sent electronically are more often photocopied and mailed using USPS. If they wanted to be really transparent, every public document would automatically be reproduced electronically and freely available for download.